Westminster City Council’s Major Applications Committee has approved plans for the re-development of the existing BT Repeater Station on Ashbridge Street, to provide 26 new affordable homes. The site is being developed by Westminster City Council and will create a 5-storey building. The existing building is currently vacant and will be demolished, leaving a small area, which BT will continue to use. At present, the area around the building is largely covered in concrete paving and tarmac and includes a vehicle ramp down to existing basement car parking. As part of the re-development, the Council will look to implement significant landscaping for the benefit of residents of the new and surrounding existing buildings. Part of this landscape strategy includes moving the existing vehicular ramp to the north west of the site, which will allow the courtyard space to be transformed into an enjoyable green space. The new building will be accessed from Ashbridge Street, but many of the homes will face onto this new green courtyard. Climbing plants trained up wires on the building will enhance its appearance and help to improve air quality. 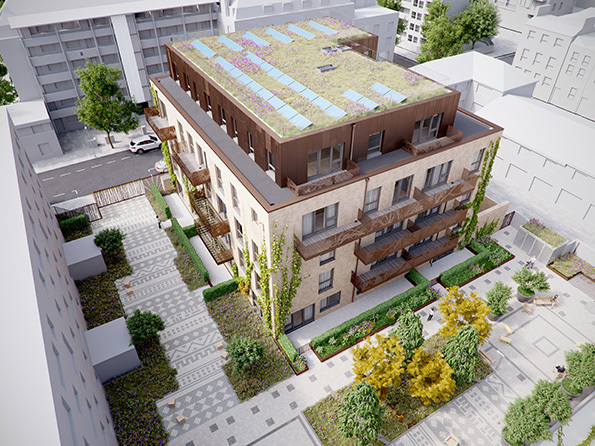 A green roof, with photovoltaic panels will complete the increase in planting to the area, supporting one of the key aims of the Church Street regeneration programme – to increase green infrastructure in the area. The building’s brickwork is chosen to complement the surrounding buildings and the new ‘carpet’ of patterned pavers will tie together the colours of existing and new brickwork, while also creating the idea of an outdoor living room for local residents. The top storey of the building and the balconies will be copper-coloured, referencing the BT repeater station’s original use of amplifying telephone signals on copper wires. Well-insulated walls and draught-free construction will ensure that residents are warm, with low heating bills. Opening windows, appropriately sized, along with mechanical ventilation, will ensure that overheating is avoided. Construction is expected to start early 2019 and will provide some of the first new homes as part of the Church Street regeneration programme, which will see the creation of approximately 1,750 new homes over the next 15 to 20 years.